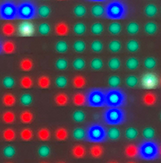 In 2016 I bought a 32×32 RGB LED Matrix Panel (6mm Pitch – distance between LEDs) from Adafruit.com because I wanted to build a project based on Conway’s cellular automata game. I had seen a similar idea in a booklet of Raspberry Pi projects that was slim on details but mentioned enough that I could find a code repository describing a simple simulation involving 2 species that would cohabitate the grid. It also linked to a C library that could drive the grid (as did the adafruit website). Adafruit makes and sells a HAT (Hardware Attached on Top) to make it easy to bridge the Pi to the LED grid. This is where things got a little confusing for me. I’m good at soldering and assembly, so getting everything together was no problem. The tutorials at adafruit are easy to follow. I downloaded the rpi-rgb-led-matrix library, and had the matrix going in no time. It was fun to play with the functions in the example code, and write a routine to get a single spot to run around the screen changing directions randomly. Explaining C code, and make files to my 8 year old son, and watching him get excited about edit, make, run, was very satisfying. The only downside of having young kids – when you get stuck, your project can sit indefinitely. And that’s what happened. Trying to bridge the gap between ferrithemaker’s lifebox code and the LED grid, was tough. I was never able to figure it out. I tried the code out of the box, no luck. I tried recoding GPIO pin identifiers to make sure they matched the adafruit HAT description, no luck. I scoured as many specs as I could find, and looking around for how the lifebox functions operate to control the LEDs, no luck. Since I had a working chunk of example C code from the hzeller distribution, I simply inserted the core of the lifebox grid into that, and replaced the drawing functions with those from the rpi-rgb-led-matrix library. Voila! It worked on my first compile! Now that it’s working I can tweak the logic and add my on rules and interactions. Maybe hook ip up to other inputs. For instance, it would be nice to model the plant behavior on local weather – rain: more plants. No rain + heat: fewer plants. Maybe let the species eat each other. Find a way to add a mutant species every now and then. Alec’s 10 now, and my project is where I wanted it to be 2 years ago. But at least it’s progress!